Dr. Margaret Abigail Walker Alexander’s contributions to American letters–four volumes of poetry, a novel, a biography, and numerous critical essays–mark her as one of this country’s most gifted black intellectuals. These accomplishments are even more remarkable given that she achieved most of them after 1943 when she was a college professor, wife, and mother of four children. Despite the cumulative demands of these pursuits, Walker prevailed, and left a nurturing literary legacy. Walker was born on July 7, 1915, in Birmingham, Alabama. Her father, a well educated minister, and her mother, a music teacher, provided an environment in which their daughter thrived. In 1931 she met Langston Hughes, who encouraged her to seek an education outside the South. Walker completed her B.A. at Northwestern University (Illinois) when she was only nineteen, and while living in Chicago she was affiliated with several important writing groups. During the Depression, she worked for the Federal Writers’ Project and contributed a dialect piece, "Yalluh Hammuh," whose folk hero would later appear in For My People (1942). As a member of the South Side Writers Group, Walker was a close colleague of Richard Wright. Walker completed her M.A. at the University of Iowa by writing For My People, a work for which she later became the first African American to win the Yale Younger Poets award. Her Ph.D. dissertation, also at Iowa, became her highly acclaimed Jubilee. 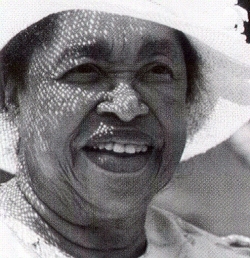 After teaching at various black colleges, Walker accepted a position at Jackson State College (now University) in 1949 where she taught until her retirement in 1979. At Jackson, she also founded the Institute for the Study of the History, Life, and Culture of Black People which has been renamed in her honor. Walker continued mastering different genres, writing the biography The Daemonic Genius of Richard Wright: A Portrait of the Man, a Critical Look at His Works (1987. Walker married Firnist James Alexander in 1943 and remained professionally active until her death on November 30, 1998.
http://www.english.uiuc.edu/maps/poets/s_z/walker/bio.htm ; William L. Andrews, Frances Smith Foster, Trudier Harris, eds., The Concise Oxford Companion to African American Literature (Oxford University Press, New York, N.Y. 2001).